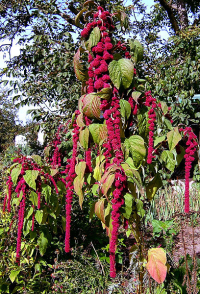 Other Common Names: Love-lies-bleeding, pendant amaranth, tassel flower, amaranth, pigweed, velvet flower, foxtail amaranth, tassel flower, chengkruk (manipuri), and quilete. Germination: Easy to germinate. Germinates in 1 week in warm soil. Plant in spring or summer. AMARANTHUS CAUDATUS A beautiful plant with drooping red flower spikes. Several parts of the love lies bleeding plant are edible, including the leaves and seeds. This plant is frequently used as a source of food in India and South America Amaranthus caudatus seeds provide high protein energy source. Roasted and added to cereal, they are excellent source of vitamins and minerals. The tender leaves are used for tasty salad greens. It is an ancient Andean indian plant called Kiwicha that was oringinally from the American tropics. The red color is due to a high content of betacyanins.